Come Play in the Sand and Surf! An affordable beach home right on the ocean! Just open the door and you're right on the sand and surf. This great vacation rental provides great views of sunsets, beach and ocean views! 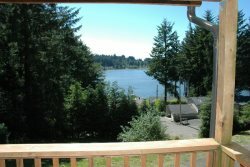 Pacific Lookout is one of the few Florence Oregon vacation homes right on Heceta Beach. Just open your doors and walk right out to the sand for hours of fabulous fun filled excitement. Explore the fabulous Pacific coastline looking for treasures that come ashore from around the world. Relax on one of 2 decks while you scan the waters for humpback whales, sea lions or one of the many sailing vessels that traverse the Pacific coast line. Catch the spectacular rays of picture perfect orange, pink and purple sunsets that others only dream about. At the Pacific Lookout see and hear the waves crashing as the surf rolls up to the beach. This family owned vacation home provides a tranquil place for rest, relaxation and get-togethers that will live in your fondest memories for a life time. Drive a few minutes north to the spectacular Sea Lion Caves, the only sea lion cave of its kind in all of North America or visit the Heceta Head Lighthouse, one of the most photographed lighthouses in the world. Enjoy fine dining just a short walk down the beach at the Driftwood Shores where you can enjoy romantic candlelight dining while watching the moon and stars sparkle off the ocean waves. Don’t forget to visit Old Town Florence where you can visit some of the finest bistros, cafes and restaurants that Florence has to offer. Visit the galleries which offer art works and fabulous sculptures and creations from many of the local artists as well as from around the world. If you are an off-roader this is the heart of the Oregon Dunes National Recreation Area. There are large areas of the dunes open to off-roading, or there are quiet hiking trails through forests and dunes, estuaries and hills to the beach. Florence is truly a center for a diverse array of outdoor activities.